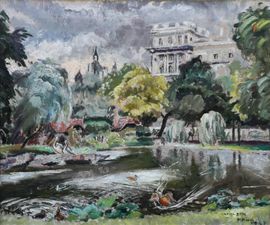 Cathleen Mann (1896-1959) was the daughter of the renowned painters Harrington Mann and Florence Sabine Mann; the Tate Gallery holds a family group by Harrington which includes Cathleen and Sabine. Cathleen studied at the Slade School of Fine Art in London and later in Paris. She went on to exhibit her work at the Royal Academy, Goupil, Lefevre and Leicester Galleries, London, New English Art Club, The Pastel Society, and many other institutions. Her work is held in many public collections in France, America and Britain, where examples are held by the Victoria and Albert Museum.